Mark Wilcox is a Consultant Microbiologist and Head of Research and Development in Microbiology at the Leeds Teaching Hospitals (LTHT). 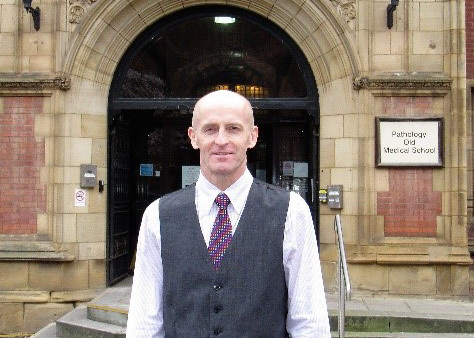 He is also Professor of Medical Microbiology at the University of Leeds where he heads the Healthcare Associated Infection research team comprising around 30 doctors, scientists and nurses. Their projects consider multiple aspects of Clostridium difficile infection, diagnostics, antibiotic resistance and the gut microbiome, staphylococcal infection, and the clinical development of new antimicrobial agents. Mark is the lead on Clostridium difficile for Public Health England (PHE) and medical advisor to the National Infection Prevention and Control lead (NHS Improvement) England. He co-leads the European Union Innovative Medicines Initiative COMBACT-CDI consortium research project. Mark is one of the foremost experts on Clostridium difficile infections in Europe and has been/is involved in numerous advisory roles for national and international organizations. He advises the Department of Health in England on healthcare associated infections, The Wellcome Trust and CARB-X panel on novel antimicrobials, and the European Centre for Disease Control. Mark has led several clinical trials of new anti-infective drugs, has carried out multiple National Institute for Health Research portfolio studies on healthcare associated infection topics and, is currently supplying central laboratory services for clinical trials of antimicrobial agents. He worked at LTHT as Head of Microbiology for 15 years, as Director of Infection Prevention for four years, as Infection Control Doctor for eight years, and as Clinical Director of Pathology for six years. Mark has published more than 430 papers and several books and chapters. He is co-editor of Antimicrobial Chemotherapy.